You can know how to get your mind to do what you want. 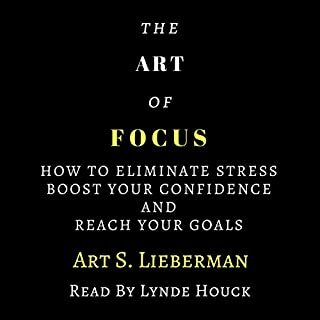 From "feeling unfocused," to "saying no, to say yes," to "easy tricks that relieve stress," to "food for mental clarity," The Art Of Focus looks at 10 big ways to easily do a great job of managing your very own mind. This short audiobook was designed to give you what you need quickly. It will literally, in about 90 minutes, hand you ways to focus on exactly what you know you need. And not only that, you will remember it even you have a horrible memory - that's if you listen to the end, and follow the easy steps! I looked at the reviews and I am puzzled at the positive reviews because this audible is awful. It would be helpful for someone whose has no experience with self improvement. It is very simplistic. You can find better material on the internet for free. I wish that I could return it.